House prices are lower in England compared with a year ago - the first annual fall in property values since 2012, according to the Nationwide. In the first three months of the year, prices in England were down 0.7% from the same period in 2018. But the building society said that annual house price rises in Northern Ireland, Scotland and Wales meant the UK average was still growing. 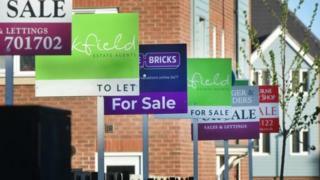 The typical home was valued at £213,102, the Nationwide said. Based on its own lending data, the building society said UK house prices in March were up 0.7% from the same month a year earlier. Robert Gardner, the building society's chief economist, said that the number of sales and the number of mortgages approved for house purchases had remained "broadly stable". However, he said that consumer surveys had suggested buyers and sellers were taking a more cautious approach. This has come as a result of a lack of Brexit clarity. Sam Mitchell, chief executive of online estate agents Housesimple, said: "The market would have preferred a decision one way or the other. Instead, we are now in this state of short-term limbo leaving many buyers and sellers unsure what to do. "Normally, we would expect to see a spike in transaction levels around this time as we enter the traditional spring bounce period, but with the extension to the EU leaving date, the bounce is likely to be a little subdued this year." Andrew Montlake, director of mortgage broker Coreco, said: "London is particularly sensitive to ongoing political uncertainty but it is also paying for the astronomic house price growth of five or six years ago." This was seen in figures comparing house prices in the first three months of this year with the same quarter in 2017. On this measure, house prices in London had fallen by 3.8% - the biggest fall for a decade, the Nationwide said. However, properties in the capital remained the most expensive in the UK at an average of £455,594. Prices in the commuter belt around London and the South East of England also fell compared with a year ago, driving the drop in England as a whole. Over the same period, property values in Wales increased by 0.9%, rose by 2.4% in Scotland, and went up by 3.3% in Northern Ireland. However, prices in Northern Ireland are still more than 35% below their high in 2007, the Nationwide said.